In what is either the boldest gamble of its history or the most boneheaded, Yahoo has filed a massive patent infringement lawsuit against Facebook. The attack by the Silicon Valley Internet icon against perhaps the most powerful consumer social networking site today — also based in tech’s heartland and also an important partner of Yahoo — is sure to be a controversial one, pitting Yahoo against a company that has surpassed it handily in recent years in regards to popularity among consumers. “Facebook’s entire social network model, which allows users to create profiles for and connect with, among other things, persons and businesses, is based on Yahoo’s patented social networking technology,” Yahoo’s lawsuit reads, in part. That includes, Yahoo alleges, Facebook’s popular News Feed, advertising methods, privacy settings and more. The company adds that Facebook has been “free riding” on Yahoo’s intellectual property and that royalty payments alone will not suffice. So what does Yahoo want for this alleged free ride? Triple damages and to enjoin Facebook from operating by using said patents. The 19-page lawsuit over 10 patents — related to advertising, privacy, customization, messaging and social networking — comes as Yahoo is seeking to right itself under new CEO Scott Thompson. Multiple sources said he is primarily driving this new aggressiveness from Yahoo. Since Yahoo told the New York Times that it was considering such a move last week, the issue has been widely debated within the company, with many top techies there opposed to it, due to the company’s longstanding ethos of using patents for defense rather than offense. Thus, the decision to move was closely held, sources said, with only Thompson and legal chief Michael Callahan largely working on it. Still, patent lawsuits have become ever more prevalent among tech companies, as they seek to battle for advantage in a rapidly changing competitive landscape. Apple, Google, Microsoft and others are involved in several legal actions, although they are largely related to mobile technology. Yahoo’s lawsuit is the most prominent in the social networking arena, a sector that has seen a huge explosion of late. Its timing could not be worse for Facebook, since it is in a quiet period for its upcoming IPO, which is expected to value the company at close to $100 billion. Yahoo has done this kind of thing before, of course, having wrangled with Google until right before it went public in 2004 over search patents from its Overture acquisition. The pair settled 10 days before the Google IPO, with Yahoo getting several million more shares of that stock. 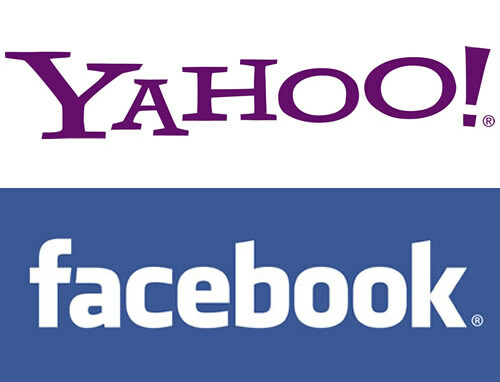 Yahoo is shaking Facebook down for much more here and with much higher stakes for both companies. If successful, Yahoo could seriously damage Facebook’s initial public offering; if not, Yahoo will cement its growing reputation as a company with nothing to lose, whose value is built not on its current business, but on non-operating assets. More importantly, at least initially, the move did nothing to boost Yahoo’s moribund shares — the stock was down about one percent to $14.49 in after-hours trading. More to come, but here is the entire document below. The lawsuit has been filed in San Jose, Calif., federal court. I’ll admit to also being puzzled about the strategery here, but I am sure there will be much more to come. Apparently, Yahoo’s new motto: If you can’t beat ’em — and it can’t — sue ’em. That would be Yahoo — the perpetual 98-pound weakling of the Internet these days — threatening powerful Facebook, which had cleanly bested it by attracting hordes of users with a plethora of popular products and services. Yahoo has already lost its audience to Facebook, which was most recently followed by its frittering away a commanding lead in display advertising, too. That would also be the Yahoo whose most recent success in improving its increasingly tenuous connections with customers was, in fact, by deeply integrating Facebook’s social hooks into its Web properties. That would be the Yahoo which has failed time and again to innovate its own offerings so drastically over the years that it has now apparently decided that its first and best strategic move under Thompson’s rule is a shakedown. Such a cynical move on rights Yahoo has long held seems more a play for the cheap seats of Wall Street, given that the company needs to look like it is doing everything it can to turn things around right now as it faces a proxy challenge. First, it ended difficult talks with its Asian partners, Alibaba Group and SoftBank, over selling back lucrative stakes there. Now, according to sources, Yahoo’s Thompson has actually been trying to make very nice with activist shareholder Daniel Loeb of Third Point — on-the-down-low chitchats that might have played a part of this latest unusual move. At least Kodak had a good excuse. The once iconic camera company had recently been trying to take advantage of its trove of patents as a way to stave off declaring bankruptcy. That didn’t work for Kodak, and it will also not work for Yahoo, whose only real option is to try to innovate its way out of the mess it has landed itself in. You know, with good ideas. Instead, the company’s leadership has opted for a road that could rain down trouble and paint Yahoo as a company bereft of talent to win any other way. And while a range of intellectual property lawsuits have broken out all over the digital sector, involving Apple, Microsoft, Google and many others, such a strategy for Yahoo could be dangerous if it fails in its legal effort to take advantage of its 1,000-plus patents, including those related to search and advertising. Others — including such tech luminaries as LinkedIn’s Reid Hoffman, who co-owns the seminal Six Degrees patent for constructing a networking database and system — hold a number of critical social networking patents, too, so who knows where this thing will go. Nonetheless, Yahoo has decided to emulate those companies with one of the few valuable assets it might have, waging its little war, right as Facebook is in the midst of its initial public offering period. Yahoo has done this before, of course, having wrangled with Google until right before it went public in 2004 over search patents from its Overture acquisition. The pair settled 10 days before the Google IPO, with Yahoo getting several million more shares of that stock (which it then, of course, sold too soon). That certainly could happen here, with Yahoo managing to grab a chunk of Facebook’s pre-IPO stock. That would mean that Yahoo’s most valuable asset would be those shares, as well as its stake in Asian companies it bought a while back for a bargain and now makes up a bulk of the company’s valuation. As to Yahoo’s core business — investors consider it almost entirely worthless. And let’s not forget: Facebook could also sue right back, which it very well might do. Or, perhaps, cut off agreeable ties that have aided Yahoo in recent years. In other words, in poking Facebook, Yahoo might now learn what it is really like to be de-friended.